We make wire rope rigging slings every day! 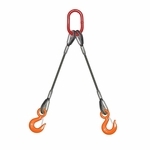 These two leg wire rope bridles come with a steel, oval master link on top and latched sling hooks on bottom. Heavy-duty thimbles in all eyes as shown. 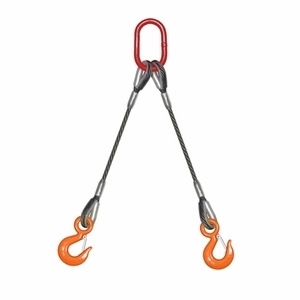 Wire rope bridles offer higher Working Load Limits, multiple pick points and greater load stability for overhead lifting. We offer these pre-determined lengths, or you can special order a custom length.